Fringe’s Friday premiere 1.9 adults 18-49 rating was a fraction above its Fall 18-49 average rating (1.88) and 12% above its latest new episode (1.7 adults 18-49). That’s much better than most of our polled readers expected. If it can maintain that level, I’d expect it to be renewed. That wasn’t the only good ratings news for Fox as the season premiere of Kitchen Nightmares also scored a 1.9 adults 18-49 rating and Fox topped all broadcast networks among adults 18-49. 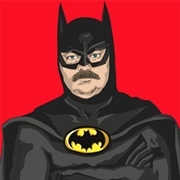 Haven't ever been able to find torrents for 'Primetime: What would you do?' though it has had some great episodes. 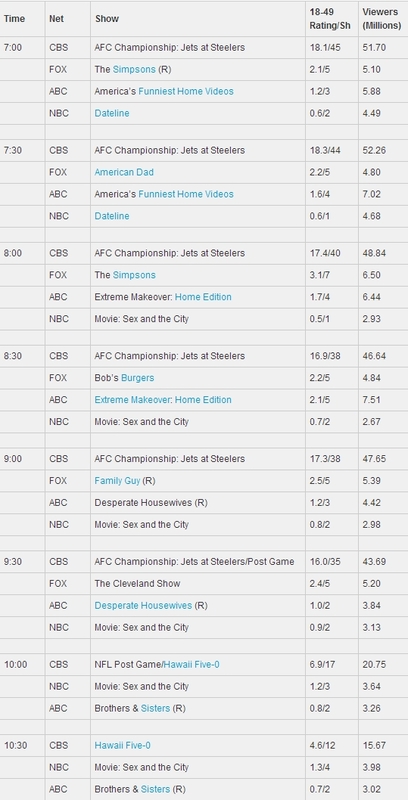 Against the AFC Championship and the special airing of ‘Hawaii Five-0? afterwards, the competition was in repeats with their highest-rated programs. ABC ran new episodes of ‘America’s Funniest Home Videos’ and ‘Extreme Makeover,’ but repeats of ‘Desperate Housewives’ and ‘Brothers & Sisters’. Fox was all-new with the exception of ‘Family Guy,’ which was a repeat – not great news news for ‘The Cleveland Show” which was down 11% to a 2.4 rating. . Earlier in the night The Simpsons was even with last week with a 3.1 adults 18-49 rating and the third episode of ‘Bob’s Burgers’ dropped 12% to a 2.2 rating. These first national ratings, including demographics, are available at approximately 11 AM (ET) the day after telecast, and are released to subscribing customers daily. These data, from the National People Meter sample, are strictly time-period information, based on the normal broadcast network feed, and include all programming on the affiliated stations, sometimes including network programming, sometimes not. The figures may include stations that did not air the entire network feed, as well as local news breaks or cutaways for local coverage or other programming. Fast Affiliate ratings are not as useful for live programs and are likely to differ significantly from the final results, because the data reflect normal broadcast feed patterns. For example, with a World Series game, Fast Affiliate Ratings would include whatever aired from 8-11PM on affiliates in the Pacific Time Zone, following the live baseball game, but not game coverage that begins at 5PM PT. The same would be true of Presidential debates as well as live award shows and breaking news reports. FOX won the night with adults 18-49 as House pulled a 3.7 adults 18-49 up 6% from last week and Lie to Me had an impressive bounce up to a 2.5 adults 18-49 rating, up 39% from last week and it’s best rating since November 2009, and likely wreaking some havoc on my “Bubble Watch” prediction. Both Harry’s Law (2.1 adults 18-49 rating) and Chuck (2.0 adults 18-49 rating) were down one-tenth from last week’s final numbers. Both shows were even with last week’s preliminary adults 18-49 rating, so there’s a chance either or both will be even with last week when all is said and done. Either way, for Harry’s Law it was the smallest drop from week one to week two for any new drama this season. The Cape was down more, cloaking an additional two-tenths of a percent of adults 18-49 and falling to a 1.6. 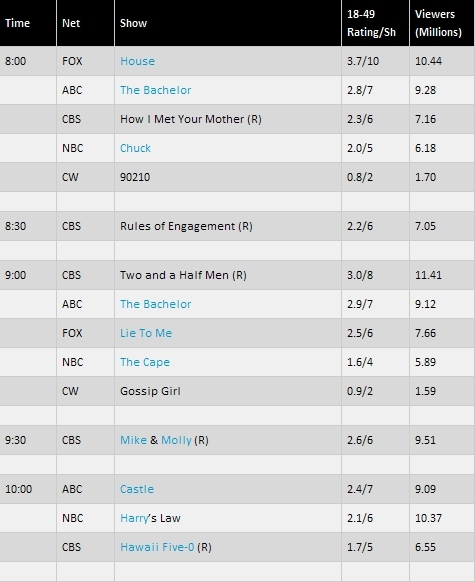 Castle returned with a 2.4 adults 18-49 rating. ‘Gold Rush: Alaska’ and a late NBA game on ESPN topped Friday night cable with a 1.1 adults 18-49 rating. ’Gold Rush’ was down from last week’s 1.3 adults 18-49 rating. ‘Spartacus: Gods of the Arena’ premiered better than ‘Blood and Sand’ last year, though was down from ‘Blood and Sand’s’ finale. ’Merlin’ had a few more viewers than ‘Gods of the Arena’ but trailed it with adults 18-49 (0.4 rating vs. 0.5 for ‘Gods of the Arena’), but Merlin was stable vs. last week. Very suprised with Lie To Me. Maybe it won't be cancelled. The worst part about that is I thought it was the worst episode in a long while. We'll see when CBS comedies return. I'm sad that Castle has lost some of its viewers, especially since not long ago it was receiving ratings closer to 3.0 and without DwtS help. As noted in the red disclaimer above, coverage of live events mucks up the preliminary numbers and we’ll have to wait for the final numbers. As of this writing (8:40a PT) we’ve not seen any of the cable news networks’ coverage of The Event yet. We’ll see those later today along with the final broadcast numbers and an aggregate tally across all networks. Only then will we know whether more or less people watched this year’s address than last year’s. ‘Pretty Little Liars’ torched ’90210? on the CW (and bettered Gossip Girl easily too, even though those shows do not go head-to-head) coming out ahead in all of the key demos and total viewers. is there any stats how many people watched the State of the Union? ‘Tosh.0? was up a tenth to a 2.0 adults 18-49 rating. I wonder what CBS will do with Blue Bloods, because it's getting rather bad 18-49 ratings and a lot of total viewers at the same time. Of course Fox won the adults 18-49 ratings on Thursday night. American Idol easily topped the night with an 7.6 adults 18-49 rating, down 3% vs. last Thursday’s 7.8 rating. Thursdays for Idol are still taking a toll though, that was down 23 percent from the equivalent episode last year (Wednesday, January 20, 2010 from 8-9p) that had a 9.9 adults 18-49 rating. Wednesday night’s episode was only down 9% vs. the equivalent Tuesday a year earlier. 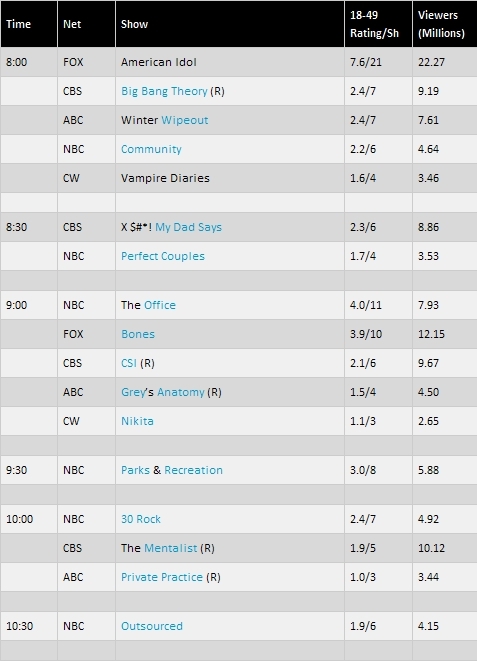 Bones was up 11% vs. last week to a 3.9 adults 18-49 rating, its highest rating in nearly four years (2/14/07). Community was flat vs. last week with a 2.2 adults 18-49 rating and Perfect Couples was down 19% to a 1.7 adults 18-49 rating. With last week’s Thursday debut of the three hour comedy block, NBC ran against repeats on ABC from 9p-11p, this week both ABC & CBS were in repeats from 9p-11p. That didn’t seem to help The Office, Parks & Recreation or 30 Rock. ‘Office’ was down 11% to a 4.0 adults 18-49 rating, ‘Parks’ was down 6% to a 3.0 and ’30 Rock’ was down 11% to a 2.4 adults 18-49 rating. Outsourced was the only NBC comedy up on the night, but it was only 6% to 1.9 rating. 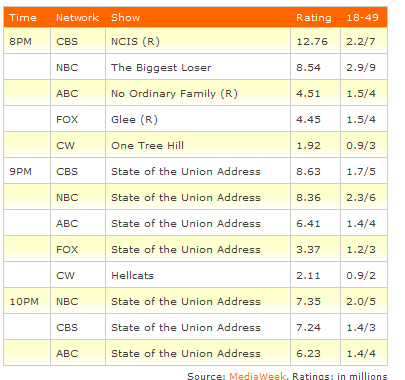 ABC’s Winter Wipeout was down 8% to a 2.4 adults 18-49 rating and with a repeat of ‘Big Bang’ as its lead in, $#*! My Dad Says was down 18% to a series low 2.3 adults 18-49 rating. 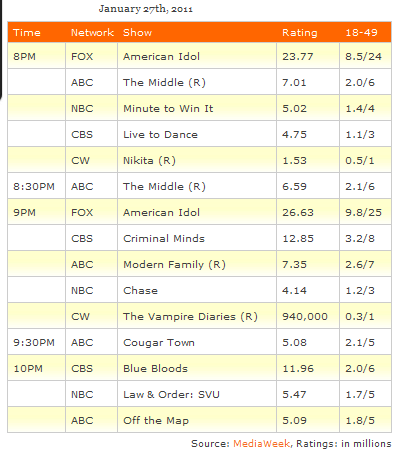 The Vampire Diaries returned to a 1.6 adults 18-49 rating and a 2.3 rating with women 18-34. 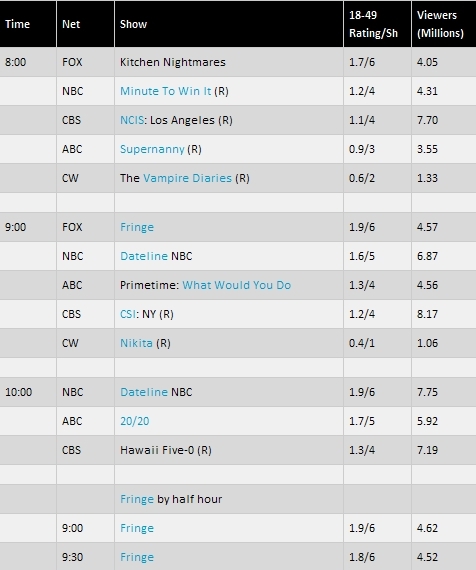 Nikita returned with a 1.1 adults 18-49 rating, and its best overall numbers since October, wrecking Bill’s prediction that all CW shows other than TVD would pull a 0.9 adults 18-49 rating for the week. There’s still a sliver of hope for Bill in the finals if a lot of people were watching whatever preempted the CW lineup in Baltimore and Chicago. A&E had the top two shows and three telecasts of the night with adults 18-49 with ‘Storage Wars’ pulling a 1.5 adults 18-49 rating and 3.32 million viewers in its 10:30p telecast and a 1.1 and 2.52 million with its 10pm telecast. ‘Dog the Bounty Hunter’s’ 200th episode was #2 for the night with adults 18-49 with a 1.3 rating along with 3.04 million viewers. TV Land’s ‘Hot in Cleveland’ shed more than 20% of its total viewers from its season premiere (from 2.949 million to 2.295 million), but through the magic of rounding was steady with adults 18-49 with a 0.7 rating. Already posted separately the numbers for Syfy’s premiere of ‘Face Off,’ but it scored a 0.7 rating and 1.44 million viewers at 10pm. I hope that Perfect Couples and Outsourced will be cancelled. Actually, I think that PC and 30 Rock should change places, it would be better for 30 Rock. P-Rex had a good lead in with the office . For me it's fine as it is , because P-rex is doing good and is still safe ; and i don't think NBC would cancel 30 Rock no matter what. I don't quite understand your enthusiasm since Fringe once again was going against repeats. Next week should be a proper test (unless CW decides to frack with the viewers again ). As for CW, I'm super glad that the repeats got horrible ratings, even VD which is their most successful show atm. 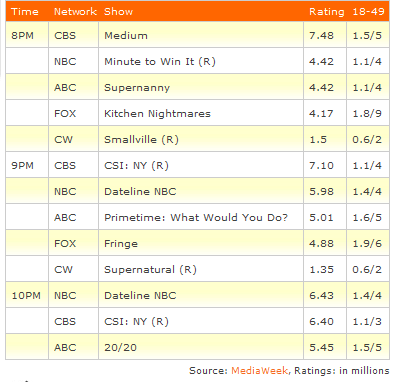 Lalala, every good rating for Fringe makes me happy.